Weekend retreats are free of charge to those who are attending for the first time. 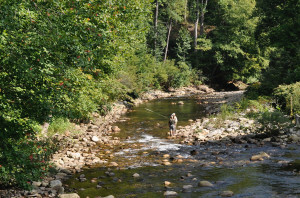 Our Three Day Retreat Weekends offer a full schedule of activities that includes basic fly fishing instruction, medical education and groups that provide opportunities for support and connection with other women surviving cancer. Retreats begin on Friday afternoon and conclude on Sunday after lunch. 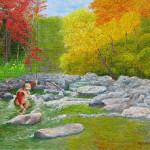 The schedule includes group activities and fly fishing instruction. Most women who attend have never held a fly rod… and many have never fished. Fly fishing instruction is simple and fun!! Fly fishing instructors and river guides are always present to teach and assist. All meals are included and volunteer staff are onsite for the entire weekend. While the retreat schedule has a variety of activities, we encourage women to participate at their own level. There is plenty of free time built into the schedule. All participants and volunteers will receive a detailed retreat schedule prior to the weekend. One Day Retreats are designed for women who want to attend but can’t get away for an entire weekend. While some of the Casting Carolinas retreats are for a mixed group of women who are cancer survivors, others are designed for specific groups of survivors. March 15-17, 2019 SC Coastal Retreat for women in SC and NC surviving all types of cancer. St. Christopher Retreat Center, Johns Island, SC. Apply by clicking “Apply for a Retreat” (below). Applications open on January 1, 2019. April 12-14, 2019 NC Spring Retreat for women surviving all types of cancer. Lake Logan Center, Canton, NC. Click “Apply for a Retreat” for initial application. Our Participant Coordinator will contact you with more information and assist you in completing a longer application. APPLY FOR THIS RETREAT ON OUR WEBSITE www.castingcarolinas.com BEGINNING JANUARY 1, 2019. April 26-28, 2019 Wildacres Alum/Staff Retreat open to all Casting Carolinas alums and staff. Wildacres Retreat Center near Spruce Pine, NC. You must have already attended a retreat or be on our volunteer retreat staff to apply. Contact: starr@castingcarolinas.com for info and application. October 11-13, 2019 NC Fall Retreat for women surviving all cancers, Lake Logan, Canton, NC. Apply for this retreat on our website BEGINNING in AUGUST 2019. Retreats begin at 2 pm on Friday and end at 2 pm on Sunday. There are limited spots available so we request that you contact us asap if you find you can’t attend. We always have a waiting list and those on it have a really good chance of getting in! We can help you find a ride so please don’t hesitate to ask our Participant Coordinator to assist. For more info please see our FAQ page.